ReclaiMe Free RAID Recovery is absolutely free and easy-to-use RAID recovery software for most common RAID types: RAID 0, RAID 5, RAID 6, RAID 0+1, RAID 1+0, and RAID 1E. The program recovers the following RAID parameters: start offset and block size, number of member disks, member disk and data order, parity position and rotation. Once you recovered the parameters using ReclaiMe Free RAID Recovery, you can run ReclaiMe data recovery software to recover data from the array; create the array image file; write the array to disk; save layout to the XML file; get the instructions and recover data using other data recovery software. 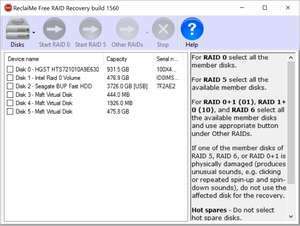 ReclaiMe Free RAID Recovery works with hard drives (internal and external), disk image files, hardware and software RAIDs. Version Build 1520 is a freeware program which does not have restrictions and it's free so it doesn't cost anything. For security reasons, you should also check out the ReclaiMe Free RAID Recovery download at LO4D.com which includes virus and malware tests. Additional screenshots of this application download may be available, too.